Well there’s no time like the present to try and clear the last of the IBA free site analyses. As they say – better late than never! 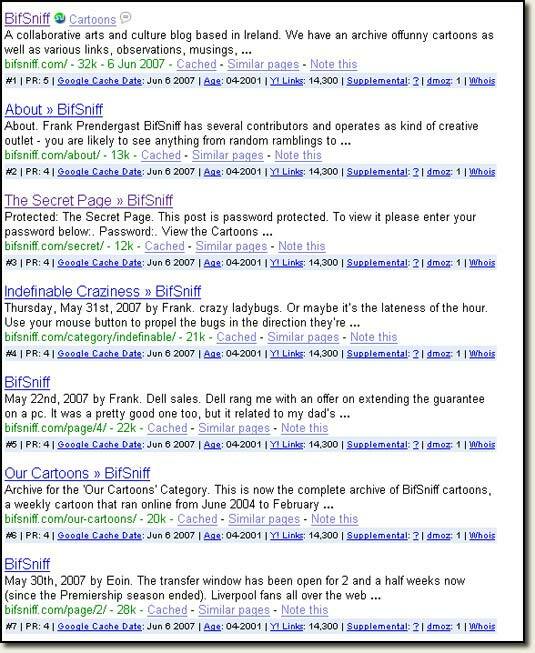 Please Note: While the following analysis relates to bifsniff.com many of the suggestions made are highly relevant to any website. I had the fortune to meet Frank a few months back when he came along the the inaugural ShareIT event in Cork. Frank has also been kind enough to let me know every time WordPress has decided to rewrite my .htaccess file (which is more times than I care to mention – damn WP). In your browser address bar type your website address WITHOUT the www. Now do the same thing again, except this time with the www. *IF* your site appeared for both addresses *AND* the address bar didn’t change for either to the other (i.e. you typed www.[mysite]. [myTLD] and the address automatically change to [mysite]. [myTLD] without the www.) then you are effectively publishing the same site two times. This is known as the “Canonical URL” issue. You see if Google can access your site via both www. and non-www. addresses it sees these as two different sites. Google does a pretty good job of filtering out one or the other from its results, but where this can hurt you is your backlink profile. Say lots of people have linked to your site and those links point at both the non-www. and www. addresses more or less evenly. Well under this situation you are effectively diluting the link love by splitting it between two sites. Now if you go and set up a really simple redirect from non-www. to www. (or vice-versa) you’ll effectively double the link love in this example. his could have an effect on how your site ranks overall. Now if Frank is reading this he’s probably saying ‘tell me something I don’t know’. That’s because Frank has mastered this a long time ago. 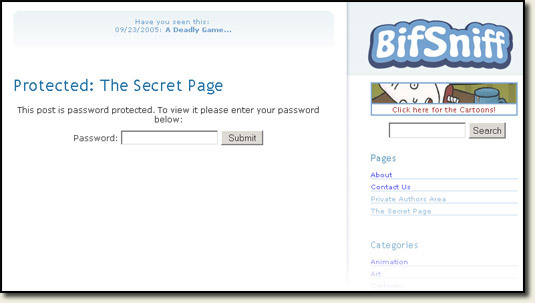 Try typing www.bifsniff.com into your browser. Now take a look at the address bar – no www. there now is there? Frank mentioned that he had a lot of pages in the supplemental index. In particular the comment feeds seemed to get supped. This is quite regular in fact. The comment feed is generally only linked to from within a post itself, and rarely will you have external links pointing at your comment feed URL. Curiously this issue has been the focus of quite a bit of disucusion (overview here, some more here) in the SEO field recently. Query 1 gives us the total number of pages indexed (2,060), query 2 the number of pages in the supplemental index (1,180), and the difference between the two (880) the number of pages in the primary index. The comment feeds are of low value and deservedly end up in the supplemental index. This is quite normal, and generally wont hurt your site. An argument can be made, however, for trying to reduce the number of pages indexed in order to ensure that Google gets your most important pages into the primary index. Get more quality backlinks. This is a key way that our algorithms will view your pages as more valuable to retain in our main index. …the main determinant of whether a url is in our main web index or in the supplemental index is PageRank. If a page doesn’t have enough PageRank to be included in our main web index, the supplemental results represent an additional chance for users to find that page, as opposed to Google not indexing the page. PageRank is passed from one resource (page) to another via links. A collection of pages that forms a any website will therefore have a calculable amount of pagerank to share between those pages. Let’s take a very simple example to show this. The homepage (‘Home’) links to 3 sub-category pages (‘SubCat1′, ‘SubCat2′, ‘SubCat3′). So each of these sub pages receives 2 PageRank units (i.e. 6/3) from the homepage. In turn each of these sub-category pages links all other sub-category pages, 2 inner pages, and back to the homepage (this is a classic ‘silo’ architecture). There are many reciprocal relationships within this very small example, and calculating the actual PageRank in and out of any page can become very complex as the number of pages and links on each page increases (I’m not even going to try). What should be obvious though is the fact that reducing the number of pages which share the initial PageRank should increase the PageRank shared by the smaller page set. That in turn may result in some additional pages coming out of the supplemental index and into the primary index. In bifsniff’s case they have too many pages and either not enough PageRank to support all those pages or PageRank is not being filtered optimally to support each page. One trick here is to specifically exclude pages that you don’t want indexed. In the case of WordPress feeds you can use this useful plugin written by Joost DeValk. The plugin ads a NoIndex tag to your feeds so they will be followed but wont get indexed. That should place the required “NOFOLLOW” value into the rel attribute. Those feeds should then no longer be indexed in Google. By changing this code (rather than using Joost’s plugin) you get the benefit of retaining your main feeds indexation while keeping those pesky comment feeds out of the index. That page has a PageRank of 4 and no external links according to Yahoo!. The same goes for the Authors Login page. Any other pages that are not adding to the user experience could also be removed in similar fashion. unique META data *may* assist you when a page is at the margin of being duplicate content. If you use WordPress there are a number of plugins available that allow you to add unique META descriptions and keywords to each page and post. Well hopefully there’s quite a bit for Frank to go with there. There was a few other other items that I came across (linking to archives) but I think this post is quite long enough. Hopefully this post will explain to people how search engines see each site in aggregate and how Google in particular decides which pages to include in the primary and supplementary index. It might be an interesting experiment to exclude the comment feeds from being indexed and see what impact it might have. Thanks again for taking this time to go through the site, much appreciated. It’s always good to have fresh eyes on something! Particularly appreciated as I realise how busy you’ve been of late! I think this would probably resolve any issues, but I don’t think I have tried it on a site experiencin the issue yet – I really wanted to figure out what was causing WP to rewrite the file when it really shouldn’t be, but after a certain amount of investigation I got confounded by it! On BifSniff the htaccess file is simply not writable so it never had that issue, I update the htaccess file by hand. But as you know I have had the issue of WP rewriting the htaccess file on other sites! @Martina – hi and thanks. @Frank – would you believe that I only re-uploaded my .htaccess file yesterday and the bloody thing has been overwritten today. I’m gonna find what it is that is rewriting the file if it’s the last thing I do [today :)]. Hope there is something of value to you above. I actually dug into the WordPress Codex and have a fix for the .htaccess problem – extremely simple. I have a post queued that explains it. You should nofollow your trackback links too. I hadn’t thought of this and I had use robots.txt to disallow access to those URLs. On the other hand, read through http://www.seorefugee.com/seoblog/2007/06/04/john-chow-creates-seo-experts/ to cast some doubt on the benefits of excluding these pages. I almost forgot, instead of modifying a core WP file, change your theme to call get_post_comments_feed_link() instead of comments_rss_link(). Next time you upgrade WordPress you won’t have to worry about losing your valuable custom changes! What does get_post_comments_feed_link() do? And does this function need to be updated to include a rel=”nofollow” attribute? TBH you could actually give these links a rel=”noindex” so that the bots would still crawl your RSS feeds, just never actually index them. It’s a bit of a toss-up though. The text ‘feed’ can be whatever you desire of course. I don’t like the idea of disallowing trackbacks and adding nofollow. It does away with the entire “interconnected web” concept in my mind, which is why I am so happy with the way MT handles it. Michele – I mean to nofollow the /trackback/ link. I read that John Chow story you linked to – the only thing there was that he had gone a little strong with his robots.txt and dissalowed most of his site. I think there’s definitely value in removing the comments feed from the index though. Yep, just the comment feeds. You’d want to be mad to try to remove the comments (even if you could, which you cant without removing the post). All I know is that you take a look in the supplemental index and you’ll regularly find the comment feeds in there. Makes sense as they have very little linkage to them and are highly duplicitous of the page they come from. Seems this might be a new function? I’m on 2.1.3 but will probably update to 2.2 now.